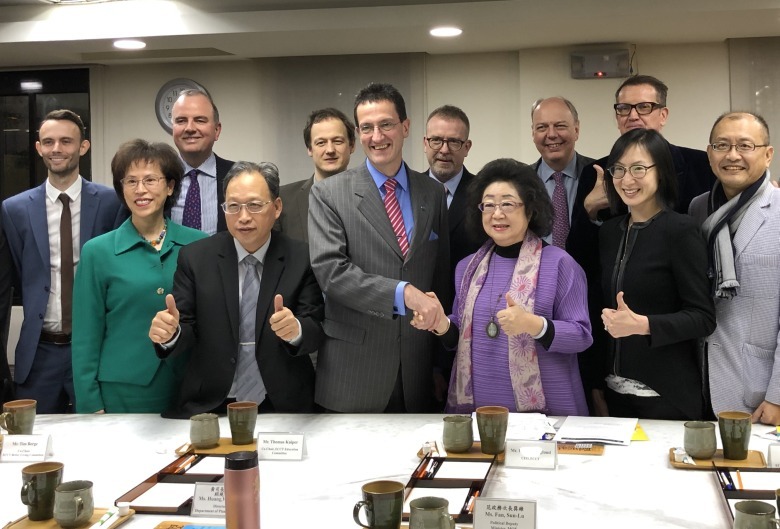 An ECCT delegation headed by CEO Freddie Höglund visited the Ministry of Education (MOE) where they met with Political Deputy Minister Fan Sun-lu and other officials. ECCT delegates, which included co-chairs of the ECCT’s Education the Better Living committees, discussed education-related subjects, such as how to improve the English language education and ability of students and government officials and how the education system can be better aligned to develop the skills and talent needed for Taiwan’s new and emerging industries. Among other subjects, delegates discussed the MOE’s role in implementing the Executive Yuan’s policy titled “Blueprint for Developing Taiwan into a Bilingual Nation by 2030”. Deputy Minister Fan confirmed that the MOE is committed to the goal of making Taiwan bilingual by 2030. In line with this objective the MOE has proposed a “Bilingual Country Project”, and proposed working towards the goals of implementing a “full-scale bilingual structure of Taiwan’s educational system”. At the meeting MOE officials said they welcomed engagement with an input from the ECCT on how best to achieve its goals.